1973 or 1974. The Wedge of Aiud, found 10 meters down in an excavation in Romania, in the same strata as Mastodon bones. It was made of Aluminum. "Specialists" analysed the metal object and dated it anywhere from hundreds to hundreds of thousands of years. An "aeronautical engineer" said the "Wedge" strongly resembled the foot of a VTOL (Vertical Take-Off and Landing) aircraft. The analysis is problematic on a number of points, whether on the mistaken oxidation age, the different metallurgical test outcomes, or the engineers drawing itself (from Alien Skies) which does not account for the rear "arms" on the wedge or the lack of pivots that would be necessary for landing on uneven ground. The aeronautical engineers drawing of the landing gear. Notice the profiles in these two views that are not accounted for. The underside of the wedge of Aiud is rarely seen in photographs. The "boring" side has obviously been slammed down on the earth many times. Deep gouges and scratches pit it's surface. 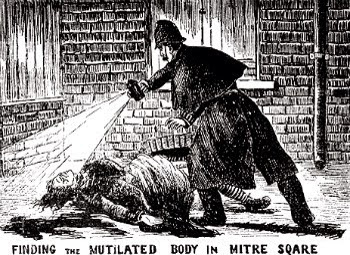 "...on its lower side of the object were traces of repeated beatings, some of which were strong". * But was it beaten under the spacecraft; or an excavator? Let's call the object of Aiud an Excavator Bucket Tooth (EBT); could it possibly be? Regular bucket teeth are generally hollow and mount of the leading edge of the bucket. But the Aiud EBT would have to mount on the face of the bucket's shovel edge. The "top" of the wedge has a mounting hole with a smaller locking hole in the back, between the wings. This arrangement would leave it hanging under the lip of the digging bucket. Going through a few industrial catalogues, EBTs are "slung under" in clamshell-style diggers. They are used where depth is an issue, since the bucket is either on the end of a long hydraulic arm or flown on a wire - especiallyuseful for things like dredging the bottom of rivers or flooded pits. Aluminum teeth are used where there is a danger of explosion or fire - in coal mining, around swamps or garbage dumps - because they minimize the risk of sparking. The Wedge of Aiud as it would appear on a clamshell excavator. A conjectural drawing by this author, which is far more explanatory than the "aeronautical engineer's", illustrates how the "wedge" could be fixed to the bucket. The forces that act on it would primarily be in sheer, so such an arrangement would be durable - unlike a standard bucket that experiences a bending moment and requires stronger mounts. Shear would be absorbed by the central 40 mm steel dowel on the bucket. 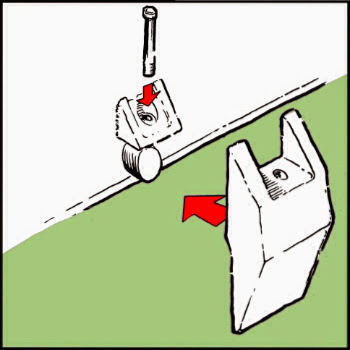 The dowel is locked into the bucket tooth using a pin inserted through the hole between the "arms". Further, the flat surface between the arms would be backed by a steel wedge matching the 45 degree profile of the "arms". 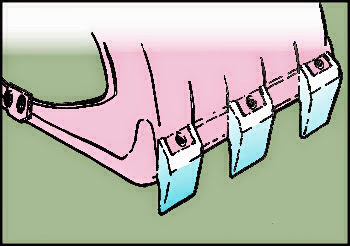 The arms themselves prevent the tooth from wanting to rotate on the 40 mm pin, and the wedged shape allows the bucket to open against rough material. A steel wedge and dowel (rod) welded on the bucket would hold the Aluminum EBT and a pin would fix it there. 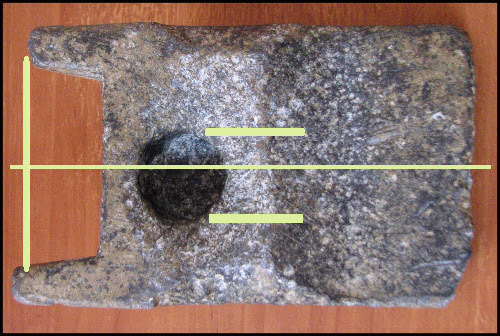 Even the wear patterns on the "Wedge of Aiud" would match the pattern of repeatedly digging wedge-on into abrasive material and clamping shut against the opposite shovel. The edges are rounded and extreme wear is seen around the 40 mm mounting pin. I believe that this diagram explains the features of the wedge fairly well. Perhaps from now on we should call it the EBT of Aiud? Again, unless Yoda was at the controls; it's safe to say that Aliens most likely had nothing to do with this piece of mysterious aluminum. 1973 or 1974. The Wedge of Aiud, found 10 meters down in an excavation in Romania, in the same strata as Mastodon bones. It was made of Aluminum. "Specialists" analysed the metal object and said that the oxide layer and the "segregation of the alloy's constituents" dated it anywhere from hundreds to hundreds of thousands of years. First and foremost: any date that can be established before the mid 19th century would raise some important questions because of the increasing impossibility of man-made Aluminum. The exact make-up of the alloy itself, in many ways, is irrelevant. Whatever alloy of aluminum the object is made of - the wedge of Aiud should not exist in conjunction with Mastodon bones. The metallurgical tests, though, are a good measure of the rigorousness of the testing procedures. And a red flag should be raised here - the tests do not all have the same results. Not even close. Sources citing the original research attribute the find to Researcher Boczor Losif. The initial tests were performed by A "Dr Niederkorn" at the Institute for Research and Design in 1975. The further tests in 1995 by Florin Gheorghe and Peter Leb were said to duplicate Niederkorn's results of 89% Aluminum, 6% Copper, and 2% Silicon (Al-Cu-Si with another few percent of impurities) which is somewhat consistent with aeronautic components but more likely made for hard-use. But later tests in 2007 revealed a different alloy each time. Some of those differences can be explained by the testing procedure used, but some cause me to question the whole story. How does the same object have different alloys? Or have constituents that add up to over 100%. (2). Central Research and Design for radioactive metals - Magurele Commune - Bulletin nr.380 analysis, sample NK-2. (3). Florian Gheorghita, Peter Leb. Having a sample tested at an unnamed institute in Lausanne, Switzerland. (4). Metallography Laboratory of the Faculty of Physics. (5). Ms. Zoia Maxim Bucharest, Magurele. The National Institute of Physics and Nuclear Engineering, Department archaeometallurgy. The strangest result is the "non-destructive test" in 2007, which I can only assume is the X-ray fluorescence spectroscopy (XRF), which is said to have a high degree of accuracy. 97.6% aluminum and 2.4% tin would make it supersaturated. If, and this is a big if, this test was done of the surface layer of aluminum - it might be explained by one feature of the manufacturing process: aluminum alloys are cladded in purer aluminum to increase corrosion resistance. It does seem a little far-fetched to waste money on cladding - considering the rough use that I suggest the Wedge was put to in an excavator, where it would regularly break rough ground. New sources state that "on its lower side of the object were traces of repeated beatings, some of which were strong". http://www.asfanufo.ro/index.php/opinii-si-ipoteze/119-calcaiul-de-aluminiu-de-la-aiud&prev=search. There could be several very rational explanations for these test differences, and I'll try to give fair report to each. Try. 1). Poor manufacturing lead to different concentrations of alloys in different parts of the Object. 2). Aliens made magic aluminum that changes dopants each day. 3.). Flim-flam. Facts are not consistent. Tests are not consistent. Backing documentation cannot be found. No archeological evidence. 5.). There is more than one object of Aiud - whether a Museum copy was made or another object was "found". 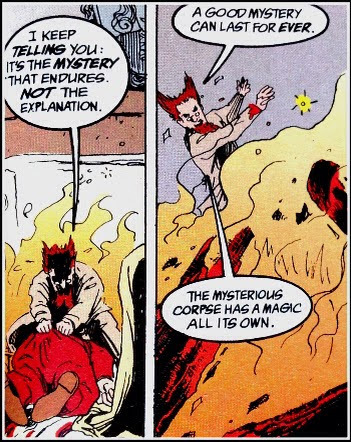 1.). The wedge itself isn't symmetrical - even accounting for the wear. It seems like it could be a sloppy casting. Just look at the hole in the wedge being off-center, while still lining up with the pin-hole in the flat face of it. The "arms" are also different lengths. 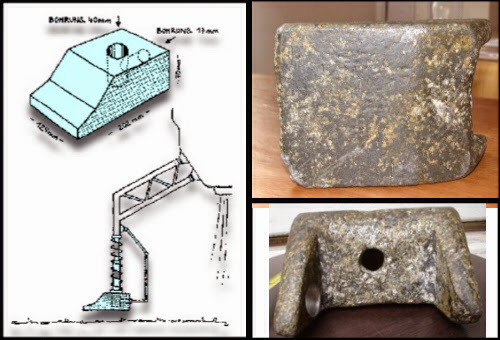 If the casting was made of recycled aluminum (using 1/20 of the energy of creating aluminum from bauxite ore) then the process may have been flawed, leaving slightly different doping of the aluminum in different past of the casting. If this was being mass-produced as part of a set of Excavator Bucket Teeth, then this is understandable. It needs Copper and Silicon for strength; Lead, Zinc and Cadmium for workability, while other doping metals may have been contaminants of the recycling process. Cheaply made, soon to be worn down and cast aside. Further, (see explanation 5) if manufactured for bucket teeth, there would have been hundreds of them. Minimum orders at present day are 500 pounds at a time - that's almost a hundred "wedges". 2.). Aliens are the fairies of the 21th century. 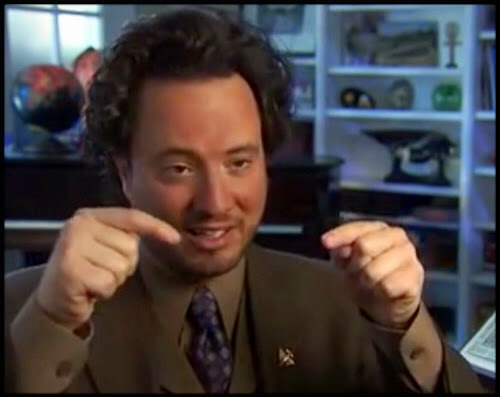 Anything that cannot be understood using folk-knowledge and "common sense" must be Aliens. Those ancestral people who understood stone as a building material through necessity - how dare they out-build us. It must have been Aliens. Dinosaur extinctions? Dinosaurs are too cool to have been killed by climate change. Must have been Aliens. The earth's last mammoths died out in the Russian North at the same time the pyramids were being built. Pyramids? Mammoths? Well, that's obviously Aliens, isn't it? What part of the story of the Wedge of Aiud actually says "Aliens"? Only the location where it was said to be found, of which there is little or no documentation. Even if it were found at the bottom of the excavation, it closely resembles a piece of excavation equipment. Very closely. Really, the only thing that says "Aliens" is a fear on the part of the human being. In the 21st century we know everything. Hey, Wikipedia! If we don't know, in a world of infinite knowledge; the answer must, by definition, be alien. 3.). The whole story is flim flam. 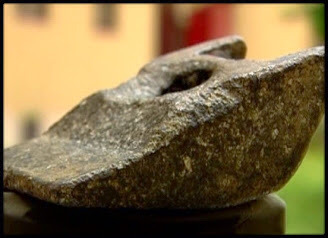 The wedge was found by what Forteans would call "a Friend Of A Friend". [FOAF: a term used to give credence to a story. Basically, it's better than saying, "An unnamed person that I don't know. 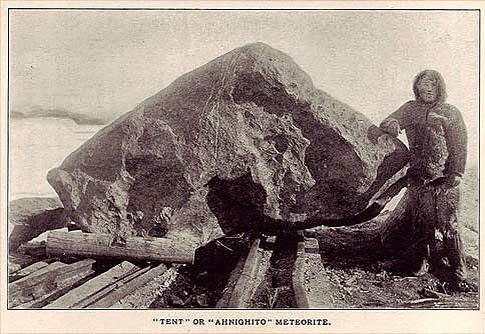 It was coined by Rodney Dale in "The Tumour in the Whale: A Collection of Modern Myths" (1978)] No original reports of the alloy makeup are available, no mastodon bones are exhibited or associated with the artifact, no photos or scientific records of it's actual recovery are shown to exist. All tests could have been made up or done on scrap. 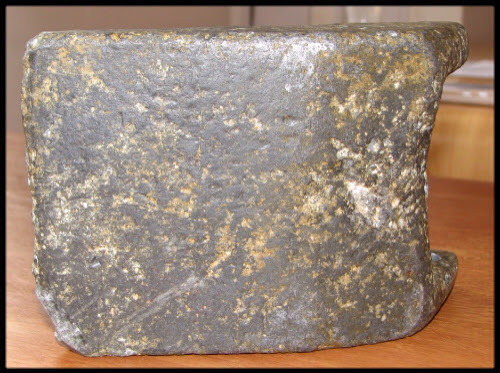 The "non-standard alloy" wedge itself was found at or near the site of a metal foundry. 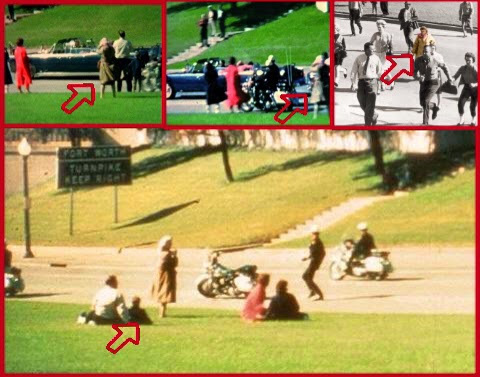 The only "proof" is the item on a shelf in photographs. 4). The sample is not from the same metal. Or the analyses were faulty - but if they were faulty, which do we take as the right one? In the Western world, Spark-OES tests have been available since WW II and are said to be accurate (when properly calibrated) to parts per million. http://www.spectroscopyonline.com/rd-opportunities-arcspark-optical-emission-spectrometry. So more recent tests are no more likely to be accurate than those of 1975. Many types of tests are available and all are fairly accurate when properly interpreted. Working in the building trades, I've learned the hard way never to underestimate the incompetence that is possible in certified "experts", particularly when not subject to some form of peer-review. In this case, the quoted specialists demonstrate a clear lack of understanding about the corrosion process, and it raises doubts about the competency of everyone involved in assessing the validity of the Object of Aiud. 5.) Museums often make copies of artifacts stored in vaults - to better protect the originals. The artifact and more specifically the documentation have been lost by the museum while it is "under renovation". 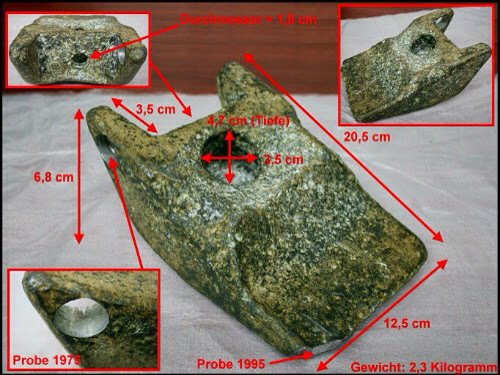 The artifact itself has more recently been "found" although the documents are still lacking. 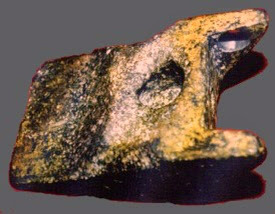 Perhaps the wedge was not "found" but replaced with a copy - whether manufactured or simply taken from the old stock of Excavator Bucket Teeth that surely existed when the wedge was found. And further; perhaps the Clujean museum lost track and has performed metallurgical tests on the copy. And that's as far as I'd like to speculate. Next: isometric diagram of how the "wedge" would possibly attach to the clamshell bucket that accounts for all it's physical features.